Sarah at tumblr found these nice set of pictures of Michael while he's apparently still in Bosnia. I translated the text from the website below. 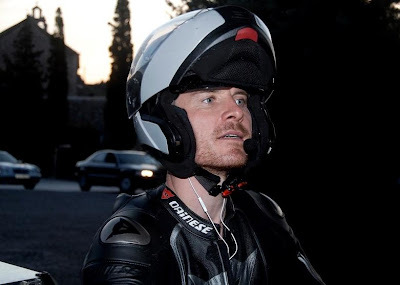 I like these photos because they show Michael doing something he absolutely loves - riding motorcycles and dressing in leather, and he's with his favorite person in the world, his father Josef Fassbender. We already know that Michael is going to be a handsome senior dude one day, and his father provides the proof! Michael Fassbender and other stars of the Sarajevo Film Festival, arrived in Dubrovnik today. 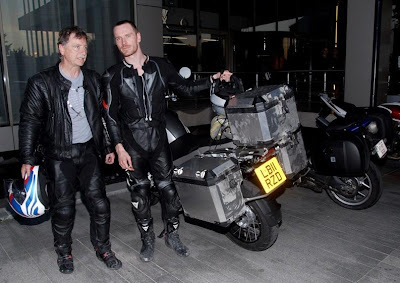 The actor who was in the movie "X-Men" movie epitomized Erika arrived Lehnsherra engine with which he gladly posed. 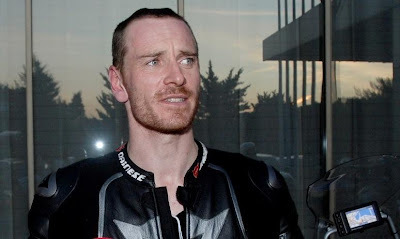 Besides him, came the Oscar-nominated director, Michael McDonagh, director of the Film Fund in Hamburg, Eva Hubert and producers Remi Burah and Philippe Bober. Tomorrow he will meet with the Mayor of Dubrovnik Andro Vlahušić will then tour the city and set sail on the boat. Isn't Mom there with them, too? Or maybe she let the boys do the bikes, and she just flew in? I haven't the faintest idea if his mother is there too. Perhaps she is.